Although I have not completed all of the modifications I plan, I have now placed my SIG P320’s fully into service. This will complete a process I began several years ago when I started evaluating what works best for me. I started with the Springfield XD family and I could shoot them well; however, I am not a big fan of the XD grip safety and the inability to easily mount a carry optic. I tried the Glock family once again (I carried Glocks officially at one time); however, after struggling with Glock for a number of months, I relearned a lesson I had discovered many years ago—the Glock grip angle just does not work for me. I also tried S&W’s M&P and shot it well. When S&W introduced the M&P Pro Series C.O.R.E. I thought I had finally found the right combination. Not quite. No issue with grip angle; however, my goal is to have two pistols as close to identical as possible, with effectively indistinguishable trigger pulls. Although my M&Ps are close, there is a subtle, but very noticeable difference in the trigger pulls. The trigger pulls on my P320 Carry and Compact are almost exactly the same and I can always simply swap the trigger modules if I want the identical pull. I just finished zeroing my SIG P320 carry pistols for my carry ammunition, the Hornady Critical Duty 9mm 135 grain FlexLock standard pressure round. I have a P320 Carry and a 320 Compact pistol each set up with Trijicon RMR06 Red Dots. 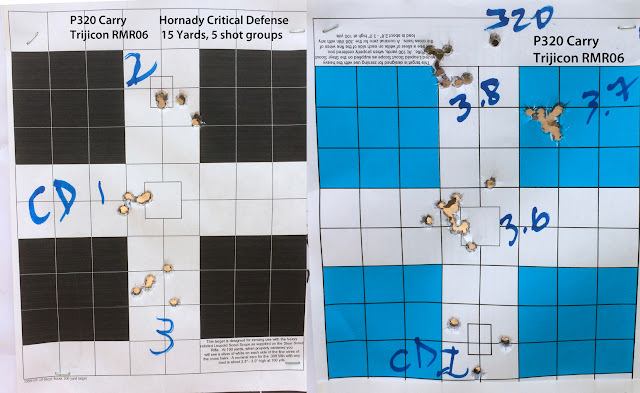 I zeroed the optics for the Critical Duty round, confirmed the iron sights, and then confirmed that my reloaded 135 grain rounds shot close to the same point of impact as the Hornady Critical Duty. Always zero your sights for the carry round and then work the reload to match the carry round. I have always had good results from the Critical Duty standard pressure round in every pistol in which I have tried it. In my pistols, the standard pressure round is typically a little more accurate than the +P version. 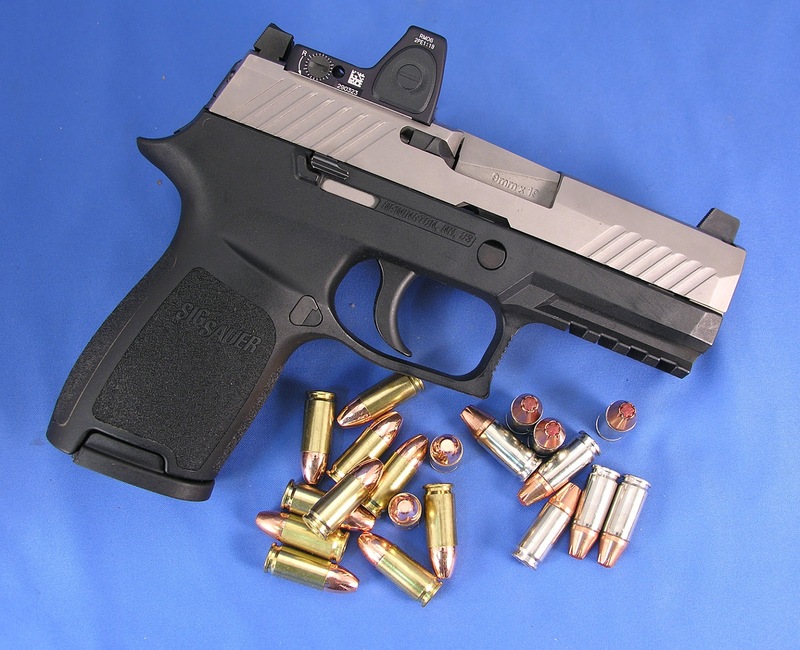 The SIG P320 is no exception. The fact that the FBI and the Texas Department of Public Safety (state police) also use a similar round is a happy coincidence. For several reasons, you should carry the round a national law enforcement agency or your state or local police carry, if possible. As an aside, always use factory ammunition for personal defense carry. When you purchase this ammunition, try to buy several boxes from the same lot. After you load your magazines for carry save at least five rounds in the box. If you ever find yourself in a short range defensive situation, the forensics examiner can use the ammunition sample from the lot that you have saved to verify distances with powder testing. Large ammunition makers keep samples for each lot for exemplar testing for 10 years as well. The forensic examiner cannot verify distances with handloads because there is no un-biased sample to measure it against. Never use handloads for self defense. Carry ammo is expensive; however, reloading your ammunition can provide a more economical practice round for matches and training if you can match the point of impact for your carry ammunition. I load the Xtreme 135 9mm-135 round nose, flat point plated bullet; Winchester primers; 3.6 – 3.8 grains of Universal Powder (more on this below); and typically do not sort my brass. I found that a load 3.7 grains of Universal worked well in my XD’s, my Glocks, and in my S&W M&Ps. My SIG P320 carry loved this load as well (see pictures--the squares are 1 inch.). However, my P320 Compact and 320 X5 hated the 3.7 grain load and were less than stellar with a load of 3.8 grains. 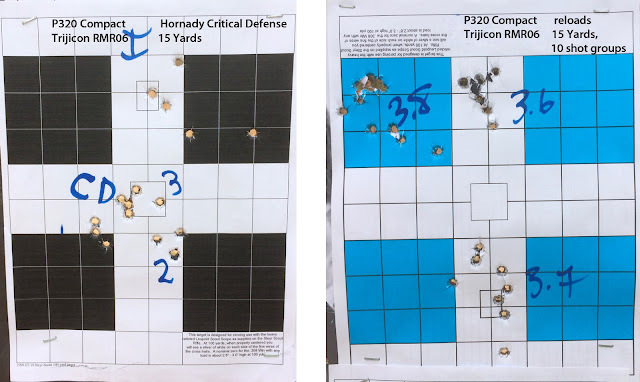 The P320 Compact preferred a load of 3.6 grains while the X5 loved the 3.6 grain load. I shot all groups over a rest at 15 yards. The Critical Defense (labeled CD) were generally 5 shot groups while the reloads were 10 shot groups. Being able to match your reloads to your carry ammunition is one of several advantages reloading offers. Reloading can be very satisfying and can save you money as well. Of course, safety protocols are always important to consider and follow. If you are completely new to reloading, there are a variety of books and online information that can help you get started. Click here for an article that discusses some reloading tips and tricks I've learned over the years through my own experience and that of others. What is the specific procedure you use to zeromyour sights? Thank you for the concise explanation on ammunition selection and the reasons behind the selection. I have set aside 5 rounds of Hornady Critical Duty in 175 Gr. 40 S&W in the original box. The reasons and logic in ammo selection are spot on, and as a result I have set aside my Barnes TAC-XPD 140 Gr. 40 S&W. for the reasons set forth in this blog article. I used to carry 2 mags with the Barnes TAC-XPD and 2 mags with the Hornady Critical Duty, now it is all Hornady Critical Duty. Thanks for all you do, I will be looking forward to your next low light handgun class when it gets a bit cooler. In the pictures, you can see each group labeled 1,2, and 3. These are the Hornady Critical Duty groups as i sighted in the Trijicon. The groups with a "CD I" are those that I shot to confirm where the irons sights printed--no real adjustment necessary. 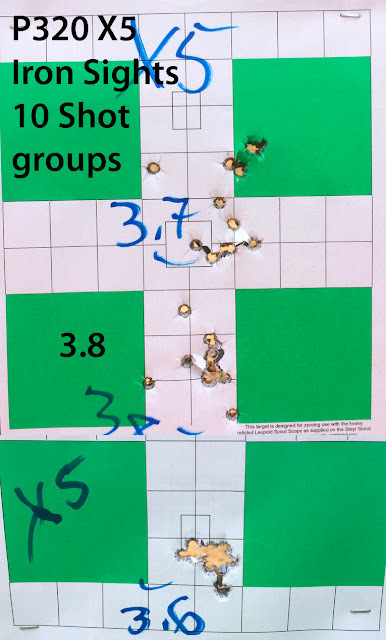 All groups shot at 15 yards from a simple rest.